The Duomo in Milano, during a brief rain-free moment in the evening. It truly is spectacular! In Rome nothing can be taller than St. Peter’s Dome, so the buildings all top out at about 6 floors. This lends an interesting sameness to the architecture of Rome, a unity in height if in no other manner. Also, in Milan, there is a “newness.” As the city was heavily damaged in WWII, one doesn’t find as many old buildings. The second thing you might notice is the streets: they are wider overall than in Rome, and fewer are winding alleyways. Some areas have broad flat sidewalks without loose stones so you can walk without watching your feet. And it is flat. Rome’s famous seven hills won’t exactly test the legs of someone from Portland, but Milan makes Omaha look hilly. Not your average mall restaurant…. I had need to go to Milan for work, and Ric came to join me for the weekend. Two days in the office passed easily enough and I didn’t have time for any culturally significant outings. Upon Ric’s arrival we headed to Centro Storico to wander around, taking a quaint little tram that dated to 1928. Now some real behavioral differences began. In Milan, those waiting to board a tram or a Metro train actually let those exiting get off before shoving their way on. Ric and I turned to each other in wonderment! What a delightful change in comportment! We shopped a bit – after all Milan is the shopping Mecca of Italy – then proceeded to supper in the Galleria Vittorio Emanuele II. To call this a “mall” is like calling Villa Borghese a “playground.” No food court or discount stores here. Rather the likes of Prada, Valentino and Versace. For the record, we didn’t buy anything in the galleria. Saturday dawned like a Portland March day, but even colder and wetter. 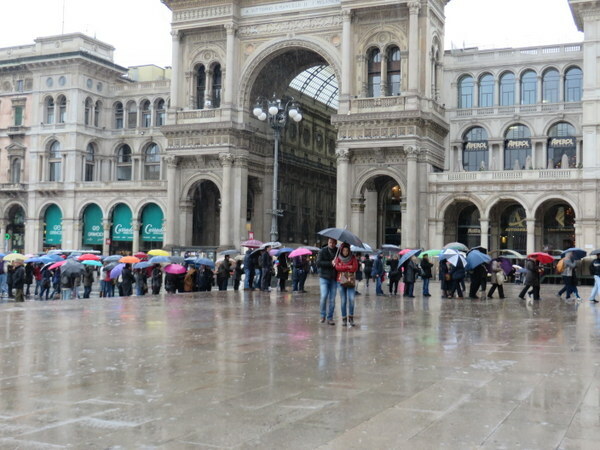 The rain did not deter the crowds waiting in line to enter the Duomo. Glad we arrived before the line was so long. It never stopped raining, making for a good museum day. We were impressed at the number of people out despite the rain. Long queues of umbrellas waited patiently to enter the magnificent Duomo, and we narrowly beat the crowd both at the Duomo and for an Andy Warhol exhibit nearby, handily avoiding the long queues because we are early-birds. The Warhol exhibit was eye-opening as we discovered some of Andy’s less-known work, all from the private collection of Peter Brant. Truly amazing that one person could have amassed such a collection from a single artist. 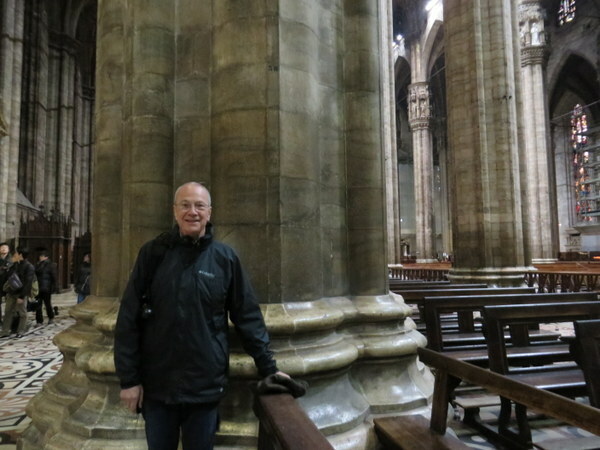 The pillars in the Duomo of Milan are about the size of sequoias. 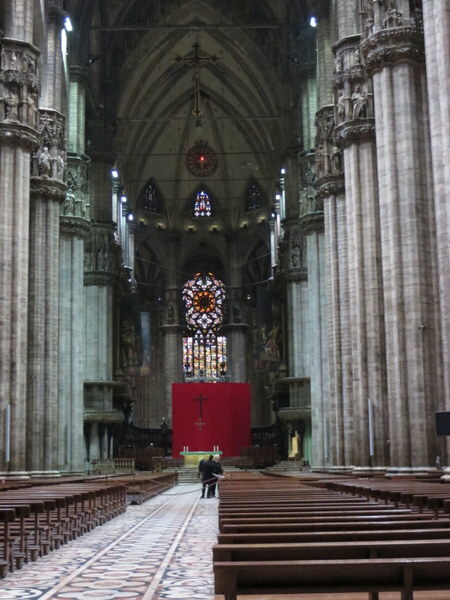 As to the Duomo, this is the fourth largest church in Europe and quite a contrast to most of those we’ve seen in Italy. Ric said “This church seems almost Lutheran,” which is quite insightful as it is predominantly Gothic, reminiscent of the Protestant Churches of Northern Europe. Of course the Lutheran churches in our hometowns lack marble, entombed remains of cardinals on display, or pillars the size of sequoias. 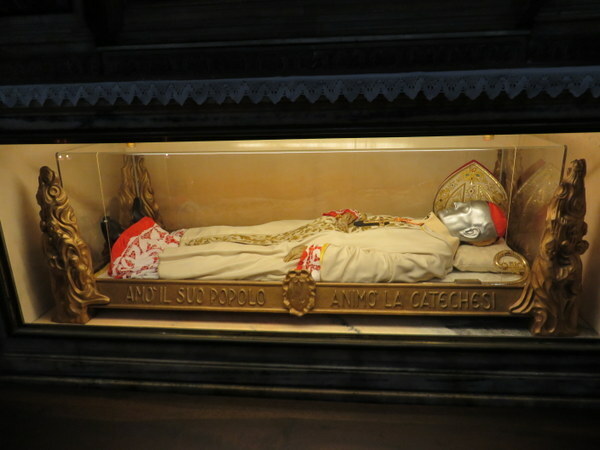 Yes, that’s the body of a Cardinal, with a silver death mask. There’s nothing like this in St. Paul, MN. 4th longest nave in Christendom, so says my guidebook. There’s nothing quite like this in St. Paul, either. The afternoon took us to a more obscure museum, Pinacoteca Ambrosiana where the building was as much art as the contents. This is a fabulous palace with amazing mosaics and inlaid floors. Regrettably, no photos allowed so I cannot show you. Again, a private collection, this time of none other than a Cardinal from the 17th century, Borromeo. In this vast collection of 1600 items there’s a Caravaggio, Raphael’s original charcoal drawing for his Vatican fresco “The School of Athens,” a Tiziano, a Botticelli or two, a DaVinci, several Brueghels, and a lock of Lucretia Borgia’s blond hair. Oh, and Leonardo’s Codex Atlanticus in its 1119 page glory is in the library at Ambrosiana. We saw 22 pages carefully displayed. (It’s only 500 years-or-so old.) Church work was very profitable back in the old days…. I don’t think Papa Francesco would approve today. For those looking at this post as a travel guide, we stayed at Hotel Teco, a sweet and relatively (for Milan!) inexpensive hotel at about €137.00 per night including breakfast. We were able to get a VAT exemption as diplomats. To my Embassy friends: don’t overlook the paperwork needed before you travel. A 17 minute walk or €10.00 cab ride from Milano Centrale, Hotel Teco is convenient to the Metro (5 minute walk to the Rosso), and Tram #1 to the Duomo is about a 7 minute walk. 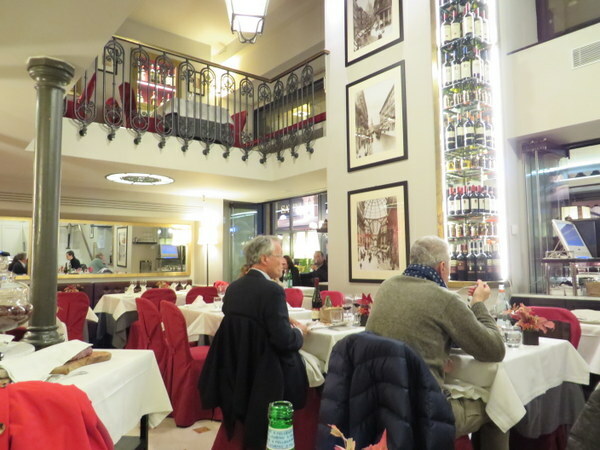 Numerous restaurants including Ristorante Sabatini (the woman at the front desk said “ottimo pizza” and she was right!) are a short walk away. I also like Osteria Mamma Rosa nearby, although we didn’t make it there this trip. I’ve been to Milan four times for work, and once prior in personal travel. I’ve either lacked time or weather sufficiently pleasant for a trip to the roof of the Duomo. I think we’ll have to take advantage some sunny summer day and hop a train to Milan just for the day and make our way to the top. Do you find the fashion in Milan really is as amazing as we hear? Thank you for reading Marcia! Thee are an amazing number of shops and boutiques. The major department store, La Rinascente, has much higher-end offerings than the one in Rome does: all designers all the time. Fashion is certainly emphasized! But we really saw normal people in rainwear most of the time. 🙂 Hard to be uber-fashion conscious when it’s pouring buckets! Yes, Portland weather, today, put me in the perfect setting to read this very interesting blog from you. When one thinks about European cities that look “new” as compared to the “old”, it causes one to realize just how much historical architecture has been lost in our life time due to war. Gives one pause, Caroline. I am amazed at the reconstruction: many things have been restored to former glory, instead of tearing them down and building shiny new. Luckily the Duomo was not directly bombed. What a beautiful building the Duomo is! Interesting the differences in the two cities. We have matching weather here in Portland today. Thanks Anita! I felt right at “home” in Milan weather-wise! The Duomo is incredible! 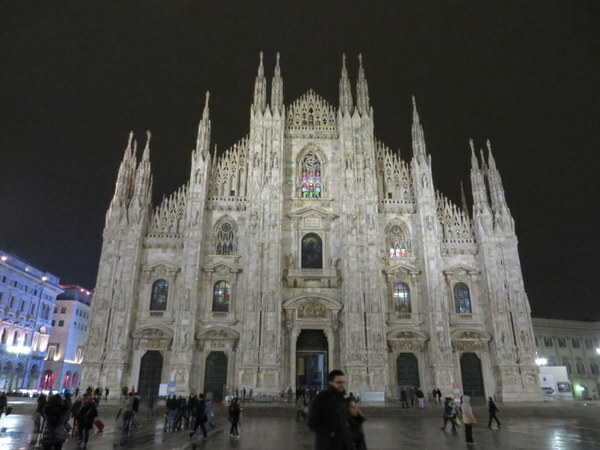 I was fortunate to visit Milan two years ago, my first trip to Italy. 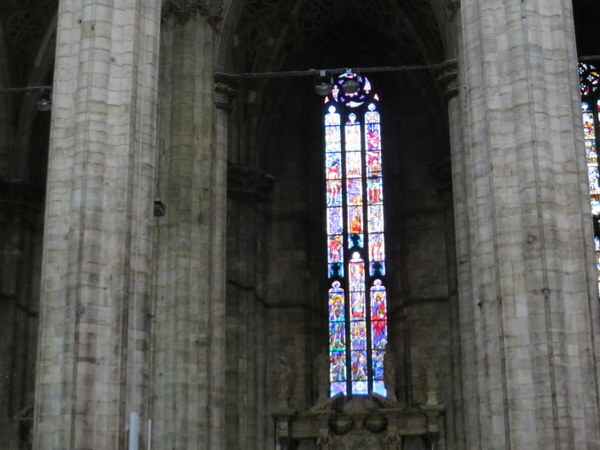 My first awe-inspiring moment came when I exited the Metro across from the Duomo. Coming up out of the Metro and seeing this remarkable building made me utter aloud my astonishment. If you get the chance, do go up to the roof. The view of Milan aren’t great, but the roof itself, wonderful. Thanks for posting. Thanks Christine. I am looking forward to hitting Milan on a good weather day so I can enjoy those spires!